Do you want to enjoy an open-air party with BBQ at your home? Outdoor speakers will provide a fantastic experience to make your party vivid and thrilled. However, setting up the outdoor speakers is not a daunting task, even you can wire the speakers outside of the room with no hassle. Even the whole process won’t take your full day but a little time of your leisure. Also, you don’t need to call an electrician for setting up the outdoor speakers. So, follow the below steps for blasting the music and enjoy it at any time especially at party time. 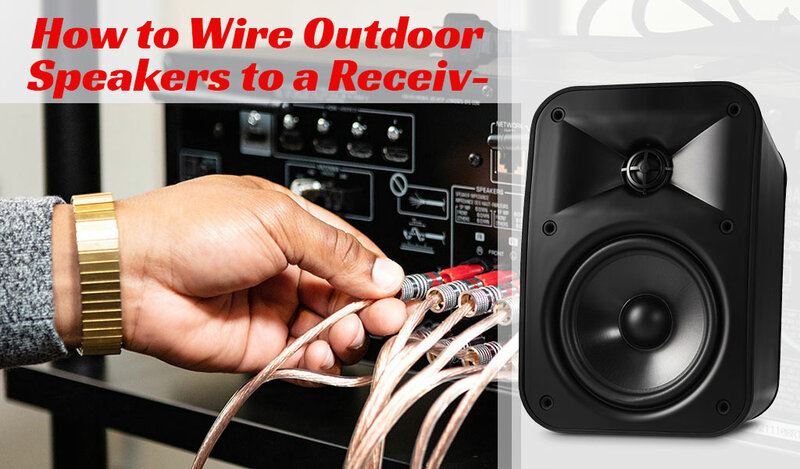 Are you still confused about wiring the outdoor speakers to the receiver? Don’t hesitate. The following process is the easiest way as any novice with zero-knowledge can connect the wires. So, let’s start. Placing is the most important consideration for wiring speakers outside the room. So, place them in a sheltered place so that nothing can harm or destroy them. Though, the latest designed speakers are designed to withstand at any elements, taking precaution will help them to live a long time. Here, underneath the patio or under the eaves will be the suitable place for mounting the speakers to protect from the weather. After finalizing the place, the speakers should be kept at a certain distance from one another. Unless you keep it apart, the sound will be muddled for the overlapping of the speaker. Also, you shouldn’t keep them far away from one another as you don’t want to miss the stereo. So, the standard distance of the speakers is 8 to 10 feet. Installing channels for the speakers is a challenge for novice listeners. Usually, a channel covers two speakers, i.e., left and right to produce a stereo sound experience. So, if you want to install more than a pair of speakers, count them and install the required number of channels for the perfect match. The proper stereo mix depends on the right proportion of channels and speakers. In fact, it is one of the most significant considerations for installing many speakers. However, if you mount the speakers along the wall, also mount the channels along that wall. On the contrary, if you use a box to install the speakers around your patio, always install the channels on opposite sides or corners of the box. Most of the listeners make the mistake of mounting the speakers before testing them. The entire task will go in vain if the speakers can’t work well. So, testing the sound quality and the projection before mount will save your time. However, always remember that increasing volume may crank your speakers. So, use more speakers than higher volume. In fact, it’ll be best to use more speakers instead of increasing the volume if you want to make the speakers last long. Mounting the speakers over sufficient height will help you to listen to the bass of the sound. Here, sufficient height doesn’t mean of 10 feet or above of the ground. If you mount the speakers above of 10 feet off the ground, the speakers can lose the projection and so you to bass. So, always mount the speakers under 10 feet but not less than 5 feet. Moreover, mounting the speakers off the ground will cover an extensive area for better listening and projection. Now, it’s time to tilt the speakers down to listen the sound precisely what you want. It also helps to reduce noise pollution as well as produce better sounding experience. Also, you can use brackets to mount the speaker at any angle. However, always follow the instructions provided by the manufacturers to mount the speakers on the wall. You may drill the wall into the mounting location. However, always remember that mounting should be on the wood or masonry. So, never try to mount on cedar or aluminum siding. It may result in sagging the speakers. It also produces vibration which reduces the sound quality. As the outdoor speakers are designed to treat the weather, always replace it with the same quality and features brackets. Otherwise, they may become weak. Banana plugs always provide more reliable and better electrical connection than the bare wire. You know a smooth and dependable connection is much crucial for the speaker as it carries signal. As speakers wire clips need a direct connection to the speaker and receiver, the banana plugs efficiently can connect them. So, how can you install banana plugs to the speaker? Here is the easiest way. As the speaker has two terminals, i.e., a red and a black- you have to separate them. Each end needs at least ¾ inches strip of the wire. When the end is stripped, put it by unscrewing the end of the banana plugs. Repeat the process for another exposed wiring. Using outdoor speakers bring a festive environment while arranging a party. So, most of the home theatre receivers can connect the outside speakers through a wire or without wire. Though wireless speakers are expensive and unstable to the connection, the wired speakers provide the best sounding experience. Also, the Bluetooth speakers have less power to produce much volume of the speakers. However, if you face any problem to outdoor wire speakers to the receiver by following the above processes, comment below with picture. Our expert team will help you connect the speakers efficiently.